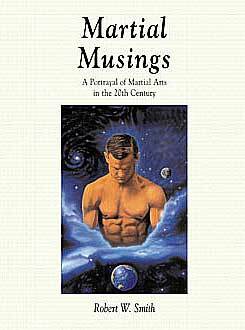 Robert Smith's Martial Musings is a ramble through martial arts practice in the US, Taiwan and Japan covering nearly all of the 20th century. We follow Smith as he tries his hand first at boxing, then judo, moving on to taiji and xingyi (Chinese boxing). Smith seems to have met everyone and seen nearly everything in the course of his study and he has written it all down here for us. The book is part personal odyssey in martial arts, part textbook, and part memoir. While he occasionally departs from the title subject, martial arts is definitely the axis around which Smith's life has turned. Smith's writing style is lively and engaging; he's an experienced storyteller. Much of the book, except for sections that have previously been printed in the Journal of Asian Martial Arts or elsewhere, has a rambling, non-linear style. Readers who are used to getting to the point quickly may become impatient. Smith makes it a journey to get to the heart of the matter, but the scenery is worth the trip. His digressions often profile a teacher, student or exponent of the martial art or sport he's discussing. Early in the book, he gives an affectionate portrait of Jack Johnson, whom Smith describes as "the greatest heavyweight boxer of all time" and a warm human being as well (p.19). At only one point does a lengthy digression, entitled "My writers: an interlude" (pages 265-276), where the author details portions of his career as a writer and interviewer for the Washington Post and other newspapers, does the book not wind its way back to make a point regarding martial arts. Though readers with an interest in the subject will find this section interesting in itself, it does seem out of place for a book entitled Martial Musings. Smith's writing is filled with clever quotations and original turns of phrase. Generally speaking, this technique serves the material well. Unfortunately, however, he uses so many authors' quotations in his introduction that the reader may fear the entire text is that way. It is not. One gets the feeling that, having written a tremendously detailed and fascinating martial arts memoir, Smith suddenly felt unsure of himself. Self-consciousness is certainly unnecessary here. Some readers will be surprised (and perhaps disgruntled) by Smith's tendency to slay any sacred cow he comes across, whether in martial arts, music, life, poetry or literature (I remained disengaged until he skewered Charlie Parker, claiming he "ruined" jazz - indeed!). Certainly no one will agree with everything Smith says. He is sharp in his criticism where he doesn't agree with a style, a technique or a teacher. Even Ueshiba Morihei comes under scrutiny, and Smith's friend, Donn Draeger, is raked for not, in Smith's opinion, giving full consideration to Chinese martial arts in his work. Likewise, Smith is equally lavish in praise and admiration for masters with whom he trained, including 10th dan judoka Kyuzo Mifune, taiji legend Zheng Manqing, and teacher Ben Lo. Smith reserves the large part of his ammunition in this part of the book for an apparently favorite target, self-proclaimed "martial arts masters" and self-aggrandizing students. He tells numerous stories of "masters" who challenged him and were later manhandled either by Smith or his students, and of students who appeared self-effacing, but were really out for whatever they thought they could steal (they couldn't). Throughout the book, Smith maintains a sense of humility, repeatedly describing himself as only a "middling" judoka, but as an always eager student and endlessly curious researcher. As might be expected, Smith's journey through 20th century martial arts is mostly a "manly" venture (he does profile Rose Li and praises several women students), but throughout the book he gives full credit to Alice, his training partner both in taiji and in life. Her photo appears over and over throughout the book, practicing, smiling, and always at his side. Martial Musings could be considered overlong, at nearly 400 pages, but I was so intrigued with the stories, profiles and opinions, I hardly noticed the length. Experienced martial artists will love/hate this book, but they should definitely read it, as it provokes thought as well as inevitably, some ire. Smith's analyses of various martial art forms are well-observed, if sometimes uncomfortable. Newcomers to martial arts will get a good feel for a history of martial arts practice from one who lived through a great deal of it. Via Media deserves praise for bringing an important martial arts memoir to the public. Not only that, but we finally find out who the legendary Jack Gilbey really is!